Discover the driest place on earth by bike on a 9-hour fat biking tour of the Atacama Desert from Iquique. In a small-group limited to four, you’ll embark on a 10-mile (16-km) ride over the dunes of the Atacama Desert. A flat downhill route and fat-tire bike means you’ll be able to travel safely and at high-speeds throughout the tour. All equipment, water, and hotel pickup and drop-off are included. Nomadesert cafe or pick-up at your lodging in Iquique. Your tour begins with hotel pickup 30-60 minutes in advance of 3pm, when you’ll board an air-conditioned vehicle destined for the Atacama Desert. Following a 3-hour drive, you’ll arrive in the Atacama Desert just as the setting sun creates a cool temperature perfect for physical activity. Then, once you’ve been kitted out with your helmet and fat-tire bike, you’ll be ready to set off. 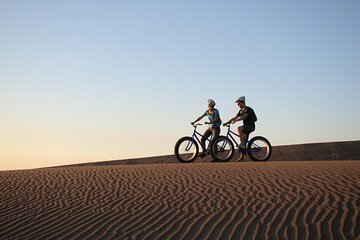 Throughout your 10-mile (16-km) bike ride, you’ll float over sand dunes and ride downhill on thick tyres with added grip. Enjoy the vivid colors of sunset and stop regularly to capture photographs and hydrate with the water provided. After cycling for approximately two hours, you’ll return to your vehicle and relax during the transfer back to your Iquique accommodation.